6th wedding anniversary gift ideas can be celebrated with sweet candy or Iron. There are a number of different gift ideas that can be used for either of these gift ideas. You can even do a combination and supply gifts in both candy or sweets and iron. Or you could choose to with the modern list and celebrate with a Wooden Anniversary gift. The second type of gift that is traditional when it comes to 6th wedding anniversary gift ideas is iron. There are a variety of gifts that you can give in this theme so there are plenty of ideas for both husbands and wives. Your very own loving anniversary couple in iron. 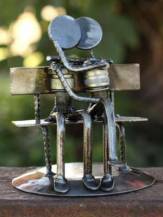 This very cute sculpture has been hand-crafted by Armando Ramírez who has recycled an amazing assortment of bicycle and automobile parts as rustic art. 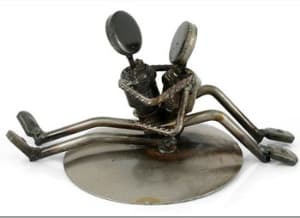 This very cute anniversary couple enjoying time together has been hand-crafted by Armando Ramírez. This would be a very beautiful way to remember your 6th anniversary. Available to buy at Novica today. Love the idea that you can celebrate with iron. You could include a lovely bottle of red wine with this gift. What makes this handcrafted sculpture by Marco Floríndez even more perfect for an anniversary present is this lovely quote on why he designed it. 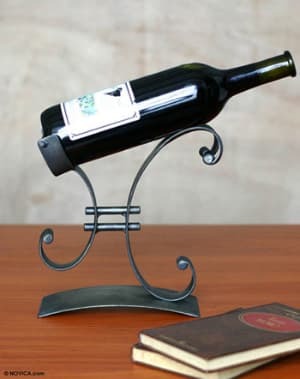 Wrought iron gifts come in a variety of different types. You can get both indoor and outdoor gifts that are made out of wrought iron. The most common gifts are going things like candlesticks, wall scones or decorations. 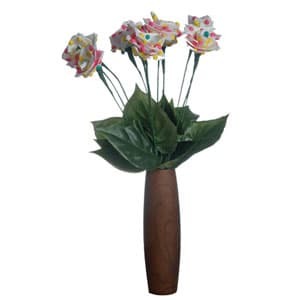 Garden decorations and outside wall decorations also make good gifts. When it comes to sporty gifts and iron the first thing that comes to mind is golf. Golf clubs are a great iron based gift to get anyone who loves and plays the game. There are a number of companies, styles and types so there is something for everyone. Golf is not just a man?s sport there are also a number of iron clubs that are designed specifically for women. You can also get a variety of gifts such as movies and music and theme them. 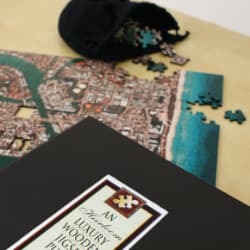 For example, getting the movie Iron man or Man in the Iron Mask as a gift is a great way to incorporate the theme of iron into your anniversary present. Candy is a great way to celebrate anniversaries as we all must have our favorites! There are a great many ideas out there when it comes to candy and coming up with a great gift is as simple as heading down to your local candy shop or hitting the internet. Chocolate is a great gift and there are many varieties out there for all price ranges. You can do something as simple as picking up bags of wrapped chocolate and a small basket and creating a lovely gift basket in a matter of minutes. 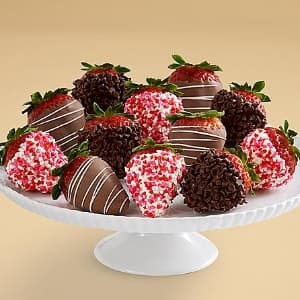 If chocolate is your thing, you cannot get better than these amazing Strawberry dipped Chocolates and there are lots to choose from. You can even get little bride and groom strawberries. Plus we have arranged for a 15% discount on your Anniversary Strawberries here. They taste fantastic and look absolutely gorgeous. What could be more romantic than a rose made with candy for your 6th anniversary? You could send a single rose or a whole bouquet and they might last a bit longer than the real thing! Just don't start nibbling them! If chocolate is not a favorite, there are hundreds of other types of candies and even novelty candies, which can be found online. You can bring back fond memories with some of the older types of candy that are now hard to find outside of specialty stores. Making a favorite dessert is a great way to celebrate your 6th wedding anniversary. Depending on what the favorite dessert is you can take it with you and it is perfect for those couples who enjoy staying in. It can add the perfect touch to a romantic dinner or just be a great way to surprise your significant other. This is also a great opportunity for both of you to make the favorite dessert of each other. You can do it as a surprise or make them together. Chocolate candy gift baskets are a great gift for couples on their 6th anniversary. 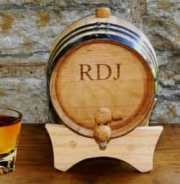 There are also lots of personalized Wooden Gifts that would make great Anniversary presents. 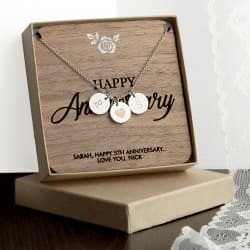 Plus lots more available in our store, ready for you to personalize with your own Happy Anniversary message.